Sadly, a couple of days ago, on Friday September 16, 20016, an Oklahoma cop shot and killed an unarmed black man, Terence Crutcher. There is absolutely no denying that, because that is what happened. But that is where the honesty in the discussion taking place on social media and in teh mainstream media ends. Yes, the cops shot him, but does that mean they “murdered” him? If you were to search the hashtag #TerenceCrutcher on just about any social media platform, you will likely be inundated by comment after comment proclaiming the cops murdered him, or worse. Yesterday, numerous people were tweeting out this screen grab of the official police statement, while calling the statement a lie (wording used varied by commenter). I’ve watched a couple of the videos (helicopter and 1st responding officer’s dash cam – both videos linked here) and I will admit that the dash cam looks really bad, mainly because we can’t see anything past the officers. On the other hand, the video from the helicopter provides us a much better view of what happened, but neither of those videos can be taken as the sole piece of evidence. Now, based on those videos, I can say, without any doubt in my mind, that the police statement is absolutely 100% correct. Just to clarify, agreeing that the official police statement is accurate does not necessarily mean that I am saying the shooting is justified. More on that later. Slightly off topic, but one thing worth noting here because far too many people are making a huge stink about it online: the comment in the helicopter video where one officer says “that looks like a bad dude” is not something that went out on the radio. That was recorded via the helicopter’s communication system that allows the pilot and observer to speak to each other. If you don’t believe me, watch the in-car video again and listen to the police radio traffic in the background. First, we have the mainstream media spreading lies. Take this headline (below) from the ABC News main website (not a local station, this is ABC corporate). Half true, half incendiary lies. 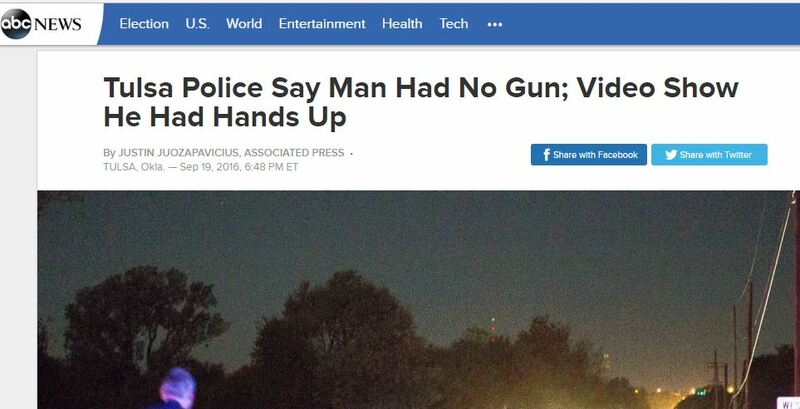 Yes, Crutcher had no gun; no his hands were most definitely NOT up when he was shot. ABC was not by any means the only mainstream “news” station to have a similar headline. What is this, Mike Brown all over again? Can we at least stick to the truth? Then there are the countless morons drawing the false comparison between Terence Crutcher and Ahmad Khan Rahami (the NYC & NJ terrorist bombing suspect), saying the cops killed Crutcher because he was black, but they only arrested Rahami. The dude who planted bombs was taken alive, but #terencecrutcher gets shot and killed for car being broke down. WTF!!?? I guess, you know, because cops like Muslim terrorists who shoot at them better than they do black men? I mean, that is what these idiots are insinuating, is it not? The fact of the matter is the cops fired numerous rounds at Rahami, and struck him and unknown number of times (I’ve 1-2 times). Yes, the cops shot both men. Sadly, the ONE SINGLE round that was fired at Mr. Crutcher clearly (from the helicopter video) struck, at minimum, some vital organs, if not an artery, which is evidenced by the extreme about of blood visible almost instantly. Both men were rushed to the hospital after being shot, one of them survived. There are many other morons out there, including Shaun king (the crazy white guy who thinks and pretends he is black) who the liberals at the NY Daily News have seen fit to give a large platform to, preaching that the cops had no reason to have their guns drawn and had no reason to even put Crutcher in handcuffs (because many people have asked why they didn’t cuff him) because he had not committed a crime. Well Shaun, your legal expertise is severely lacking. It is not necessary that someone have actually committed a crime in order for cops to handcuff them, or point guns at them. If the cops suspect they may have committed a crime, they can be detained, in handcuffs even. If they are refusing to cooperate, force can be used. More on that later. Further expanding on the irrelevance of the whole unarmed argument, Crutcher began ignoring the officer’s commands, he turned and walked back to his vehicle. As he walked, his hands were in the air, but they were only in the air until he got to his driver’s door. At that point, his hands dropped and he began digging in the car, still ignoring the officer’s commands. Honestly, when watching this video, it immediately made me think of a video EVERY cop has seen in training, and I would be willing to bet it was going through those cops’ minds too. The shooting death of Deputy Kyle Dinkheller. When examining any police use of force, from a simple twist lock all the way up to deadly force, there is one thing that must be considered, and that is whether the cop’s actions were “objectively reasonable.” That phrase and concept come to us via a US Supreme Court Case that was heard in 1989, Graham v. Connor. The court ruled that only the information known to the cop at the time of the encounter (not facts later discovered), in conjunction with that cop’s training and experience, would lead another equally trained/experienced officer to make a similar decision. In other words, were the cop’s actions objectively reasonable with the information they had at the time. One last thing that we need to clear up before I delve into my opinions on this shooting; murder, by legal definition, is the unlawful, intentional killing of a human being. Ok, so now that we’ve got the lies and half-truths addressed, let me offer my own opinion, however limited. As I said, I’ve watched the videos. From other reports, whether or not they were accurate, it appears the first officer encountered Crutcher while driving to another, unrelated call. Per those reports, Crutcher was not cooperative from the onset. While we do not see the beginning of the encounter, we do see that he is not cooperative from the time he is on camera. As soon as they have him in camera view, he is turned away from the solo, much smaller female officer, who has her gun drawn, and Crutcher is walking away from her. Crutcher continues to walk away, ignoring commands, and walks to his car and begins reaching inside the car. Crutcher is shot while still reaching in the car, falls to the ground and does not move again. What I can assume based on the facts is that the encounter between Crutcher and the female officer is confrontational at a minimum. If it was not, she would not have requested code 3 cover. If the encounter is going bad enough that you are requesting code 3 cover, it is reasonable to have your gun drawn. Cops have every legal right to detain Crutcher at the onset of this encounter. His car, which they have no way of knowing it is even his, is stopped in the middle of the street, and is actually on the wrong side of the road. According to the reports, he approached the cop and was immediately confrontational. That is two things that are not normal, which should lead anyone to wonder what is going on. Since it is the cops job to investigate situations like this, and the cops are present, it is legal and reasonable to detain those who are involved. If the subjects are cooperative, handcuffs may not be used, but if the subject is uncooperative, as Crutcher clearly (from the video) is, handcuffing him would be normal (once sufficient cops were on scene to do so). So yes Shaun King, the cops could very well have legally detained Crutcher in handcuffs. As cops encounter any situation, we have no magical way of knowing who is a good guy and who is a bad guy. The first thing that gives us an inclination of which side of the spectrum they fall on is their behavior. Crutcher, at the earliest point we see him in the video, is most definitely not acting like a good guy. Acting in a confrontational manner, and refusing to follow lawful commands, only serves to put the cops more on edge, and put you in more danger. Crutcher walks all the way to the driver’s door of the vehicle and begins reaching through the open window, doing something that the cops cannot see. 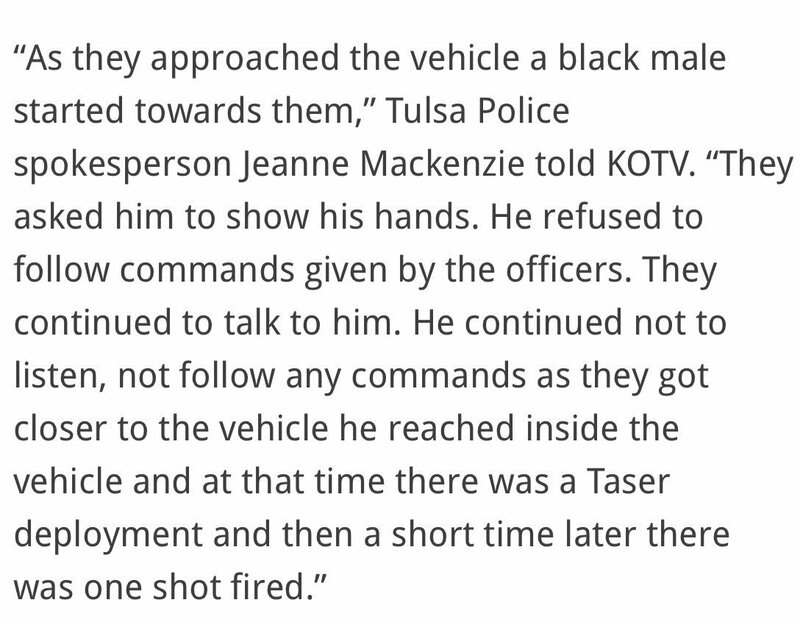 This is yet another red flag to the cops, and any cop in that situation is going to be assuming the worst. We have no idea what was said between Crutcher and the initial officer. Depending on what Crutcher told her, she could have had very real concerns that Crutcher might be planning on taking offensive actions towards her or the other cops. For all we know, he could have said “I’m going to grab my registration from inside the car” or just as easily, he could have said “I’m getting my gun and am going to kill you.” The fact of the matter is, none of us knows what was said, and none of us should assume one way or the other. So, the million dollar question is, did those cops “murder” Terence Crutcher? The shooting appears to have been intentional, so half of that murder question is a yes, but was it unlawful? We do not have enough information to make that call. Granted, lacking any knowledge of cop work, and looking at the videos, especially the in-car camera, it looks bad, but we cannot judge the incident only on what we see. With that said, I suspect it will be found to be a lawful shooting, based on everything going on here. I think the objective reasonableness standard will be found to have been met in this case. Would I have fired? Damn, tough call. Some cases are a slam dunk “absolutely!” This is not one of those cases. I wish I knew what was said, and what transpired before the cameras were on scene. With what we have available, I don’t know. However, one thing I can say without a shred of doubt in my mind, if Terence Crutcher had cooperated, if he had followed the lawful commands he was given, he would be alive today. Folks, this is not about skin color, none of it is. It is about not doing stupid stuff when the cops are pointing a gun at you. All of the above is the opinion of me, Matt, an actively employed deputy with 20 years on the job. 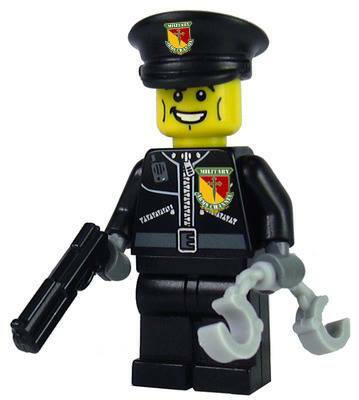 I realize some folks might dismiss my opinions because I’m one of those evil cops. For another opinion, one from a man who is not a cop, read this article by Bob Owens at Bearing Arms. Latest Update to this who situation is that not only did the female officer who first contacted Crutcher say that he was acting as if he was on PCP, but the cops located PCP in his car when they conducted a search of it. This does not mean he was necessarily high at the time. We will have to wait for the autopsy and blood tests to determine that. The Tulsa Police have released two different 911 calls that they received from citizens regarding Crutcher’s behavior and his car. These calls were made prior to the officer contacting Crutcher. So, it now appears that the cops were not the only people who thought he was acting as if he were high.